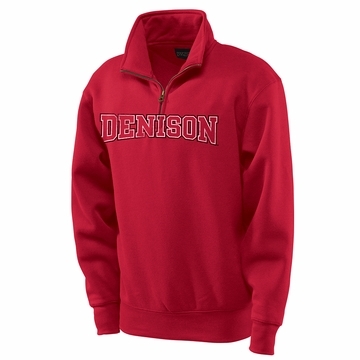 Quarter zips are in right now with the college students. These sweatshirts come in a variety of colors, this one being white, for the different preferences of the students. They are mainly cotton in origin so you might want to size up or not put through the drier the first couple of times so it does not shrink. Additionally, these sweatshirts, made by Jansport, do run on the small size so it is best to size up if you are between sizes. The Denison logo across the chest is split by the zipper and does have a bit of a weathered look to the lettering as to give it a more modern/ younger appeal. These make the perfect gift for almost any student.